YAY! It's finally October! Which means I can officially put up all of the Halloween decorations! The kids are SO excited about Halloween that they have already picked out their costumes! We save our costumes and use them for "dress up" or "pretend play". It is a great way for them to explore through imagination and can help them express their feelings as well. I was introduced to Little Adventures last summer. I seriously feel in love with the company. Little Adventures sells soft, washable, affordable dress ups. The company was started 15 years ago by two moms who were tired of itchy, scratchy dress ups that fell apart and were not washable. They wanted dress up clothing that children could wear outside, take naps in, or even wear to the grocery store! 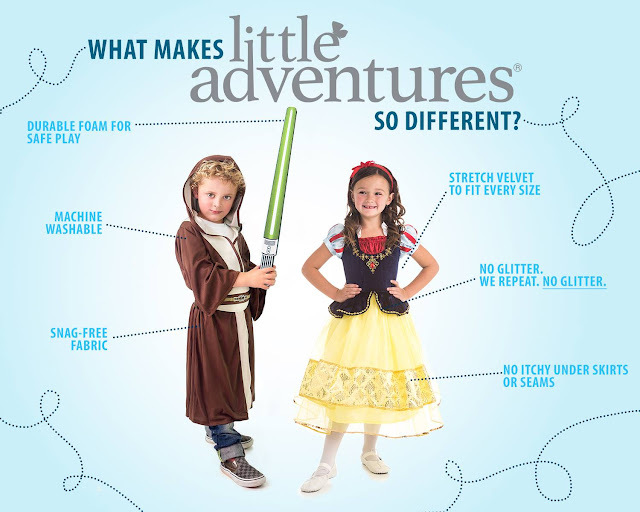 And what make Little Adventures different from all the rest is that all of their dress up clothes are machine washable. Anyone with little kids understands how this can be a lifesaver to extend the life of dress up clothes. Little Adventures suggests to line dry, as this will keep the unique trims and fabrics looking their best. I love all the details on each and every piece. I love that they have outfits to choose from for both girls and boys as well. My daughter wanted to be Moana last year, but their Polynesian Princess dress was so popular that they wanted to save their stock for customers. 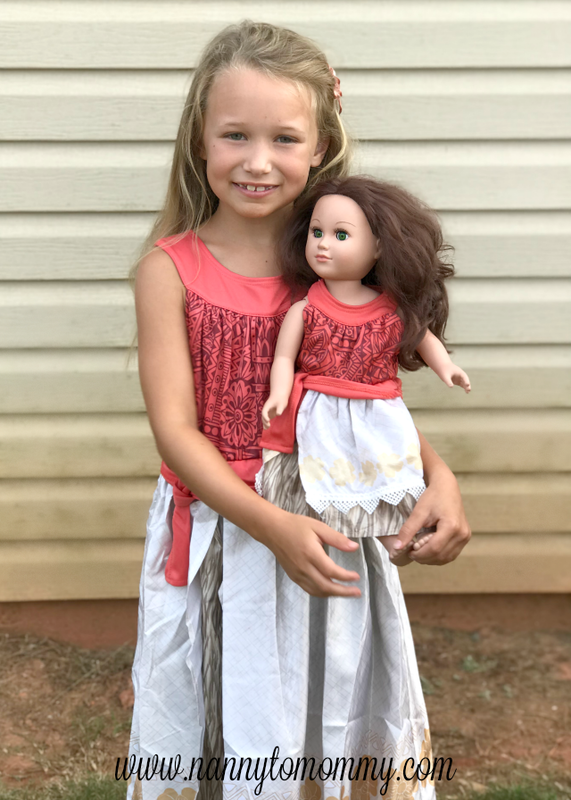 She is so excited to finally get to match her doll since last summer I got her the Polynesian dress that fits perfectly on her "My Life As..." Doll that she got for her birthday. It is very similar to an American Girl doll, if that helps for comparison. 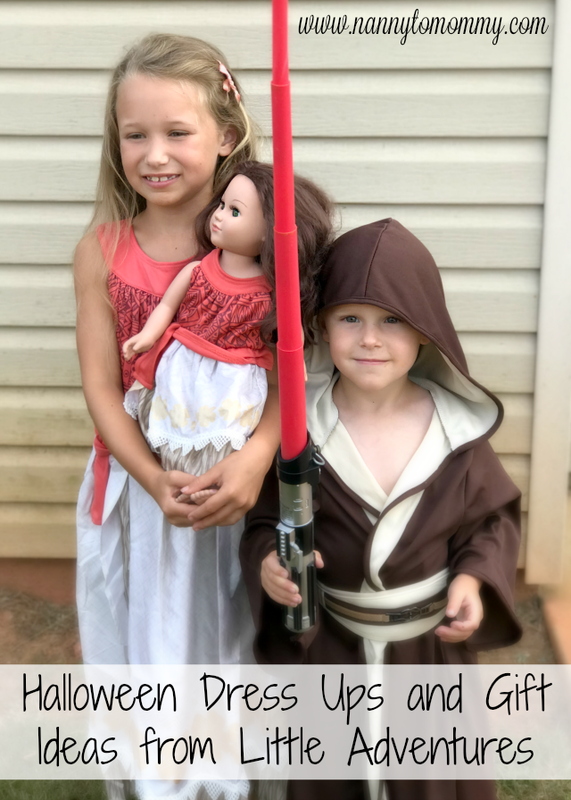 My son LOVES Star Wars and Little Adventures is extending their collections to include more dress ups for little boys! My son says, "I'm going to be a Star Wars man for Halloween." Haha It's so cute. 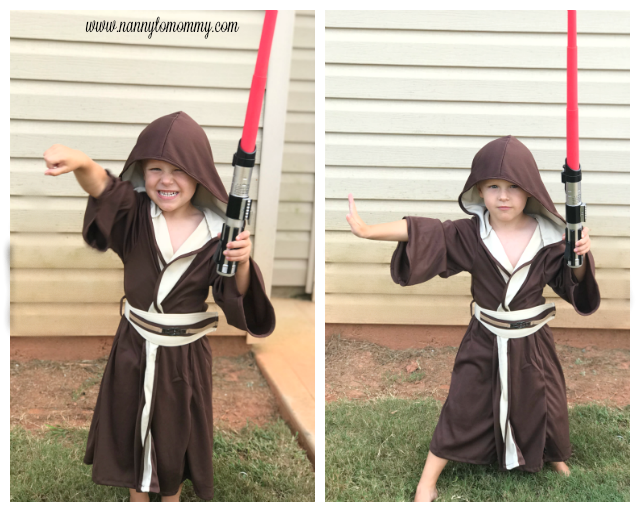 And he loves dressing up in this Galactic Warrior robe. Little Adventures also has a referral program if you sign up as well. And if you use my code MRSDCHASTAIN15% you can score 15% off their entire website, making some for great deals and great gift ideas too! And they always have free U.S. shipping. 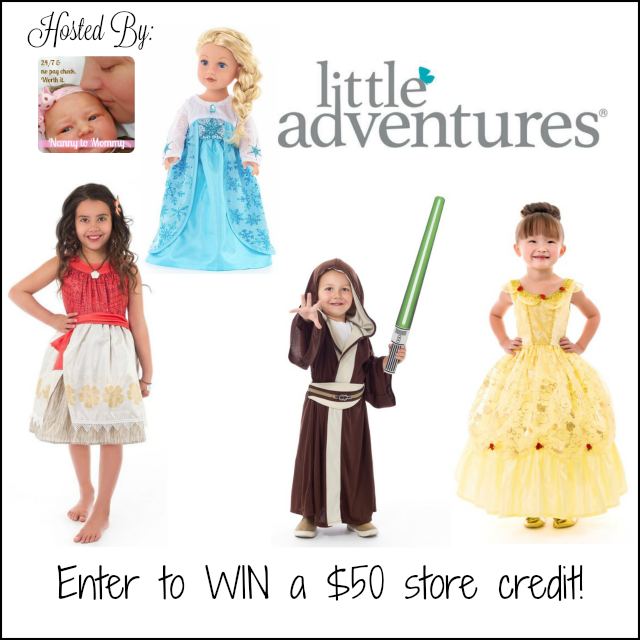 One lucky Nanny to Mommy reader will win a $50 store credit to Little Adventures! Entry is simple, just follow the prompts on the Rafflecopter below. Open US only, must be 18+ to enter. Winner chosen via Random.org through Rafflecopter. All winning entries are verified. Please follow us on Facebook to stay up to date with our current giveaways. Good luck! Welcome to "Howl-o-Ween" Giveaway Hop! 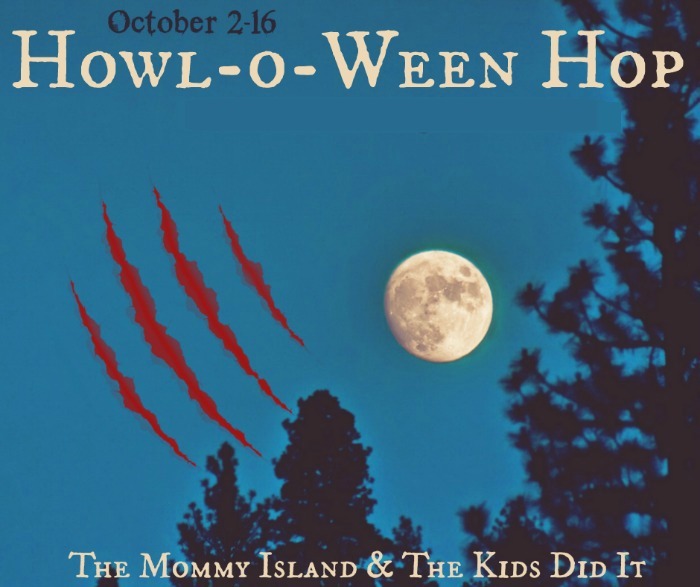 This event runs October 2nd to October 16th! I received complimentary products to provide this post. All opinions are my own. Facebook, Twitter, Pinterest and any other social media are not affiliated with this giveaway. Nanny to Mommy received complimentary products to provide this review and giveaway. Nanny to Mommy is not responsible for sponsors who do not fulfill prize obligations. This giveaway is open to US only, must be 18+ to enter. Cannot be shipped to P.O. boxes. One entry per household/IP address. No social media was involved in this giveaway in any way. Winner is chosen via Random.org through Rafflecopter. ALL winning entries ARE verified. Winner will have 48 hours to respond with all information in email or another winner will be chosen. If you would like to see your product featured on our blog or sponsor a giveaway event, please contact us. Adventure Knight Cape & Sword Set is so cute. I like the prices of there products and how well they are made. I love the deluxe cinderella butterfly dress. I love the adult snow white dress! I love the Yellow Beauty dress! I love all the different outfits for the kids , so many cute ones to choose from, My grandboy will probably like that galactic warrior robe. I love that the costumes have no glitter and are washable! My daughter would love their Pink Cape and Mask Set; she’s our little super hero! I really like the Adventure Knight Cape & Sword set for my grandson. He would love it. I love that they are machine washable! I like the ice princess costume! The Little Pet Clinic is a wonderful toy! I think it will make a great gift! I like the queen of hearts outfit. I like that their dresses are machine washable. The coronation dress is the favorite here. I like the wide variety they have. I like the little beauty salon set. My favorite is the Sleeping Beauty Day Dress with Headband . All the princess dresses are extremely cute. My grandson would love their bat cape and mask costume. Love the variety they offer. I really like the Dragon Queen with Soft Crown. It is so cute and I love the brightness of the dark colors. I love that their outfits are machine washable!! That helps so much! I love the Cinderella Day Dress with Scarf!! They have beautiful princess dresses. I like the Deluxe Snow White dress. My niece would love the Dragon Wings & Mask Sets and the Cinderella costume! My favorite is the Asian Princess dress, so pretty!